One of the struggles for many Americans when it comes to their finances is trying to juggle multiple payments every single month. This balancing act has a lot of consumers stressed out every payday. It is not easy to be thinking about several payments every single month. As you get older, you take on more financial responsibilities. The most common would be your credit card debts which could have been used for a number of reasons. It could have been used to pay for groceries, clothes, shoes, vacation, or even to pay for medical emergencies. As versatile as the card is, it can also negatively affect your budget if you lose focus and get lost with all the payments that follow every card use. There are also big ticket items which you pay for every month. The biggest of which could be your mortgage loan. You could also have car loans or even student loans in the mix. When you find that you are trying to juggle multiple payments every month, these are some of the things you have to focus on every month. Once you have a lot of payments to think of every month, you need to start looking at ways to manage them better. Here are a few things to look into to help you juggle your payments. The first step is to have discipline when it comes to managing your finances, especially when spending money. You need to make sure that you do not keep on adding unnecessary expenses on your budget. One place to start is your household budget. To start with, you need to have a comprehensive budget as your jump off point. This will help you plan better and give you a complete list of all your financial obligations. It will also give you an honest assessment of how much you earn every month. With those two, you have a better idea of how much you can spend every month. The goal is to not go over that amount and if at all possible, spend less than that. 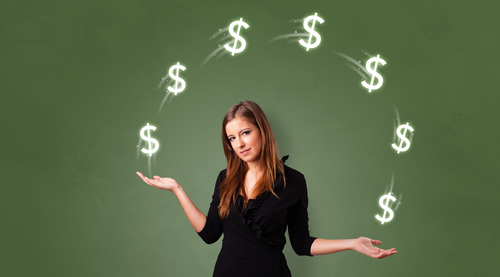 To help you juggle multiple payments all at the same time, you would heavily rely on your household budget to get by. The only way to stay on top of your debt payments is to know what they are. Your budget can give you an idea of what your payment responsibilities are. This allows you to stay on top and on track with your payments. That being said, you need to have a comprehensive list. It will be of no use if you just create a general list. You run the risk of overlooking certain payments which will put you deeper in debt. Forgetting a payment will give lenders the chance to impose multiple penalties on your account. From interest payments to fees and other charges. These will only make you pay a bigger amount the succeeding months. To help you remember and juggle multiple payments, you can use technology as a financial advantage. You can quickly set up reminders on your devices to help remind you of pending payments. It is best to set the reminder ahead of your due date. Doing it on the day you have to make a payment can stress you out especially if you have a lot of things to do on that day. Remember that lenders will only post your payments once they receive it and not when you send out the payment. If you are mailing your payment, you would have to send it out days before the due date. This gives you time for your lender to receive and post your payment. Of course, there are a lot faster options you can choose from. For one, you can walk into a bank and make a payment for almost anything. Technology has made it a lot easier to perform online banking. What started as merely checking your account now gives you the ability to make online payments. What more, there are lenders who are willing to shave off and reduce your interest rates if you sign up for automatic debit payment. This will not only help you pay on time but save you money as well. Consolidating all your debts will make your monthly payments simpler. You will literally combine all your debts so you only have one monthly payment. This will make it easier to remember your payments. At the same time, it will be easier to budget. Once you get your income, you can put this one payment aside and that will minimize the chances of you spending it on something else. Here are the benefits of consolidating multiple debts. If you are having problems in trying to juggle multiple payments, consolidating your debt can be a great debt relief option. The ability to combine multiple payments under one account can help give you better oversight of your financial obligations. You do not have to worry about several payments when you consolidate your payments. Take your credit card debt for example where you might be paying for multiple cards with different lenders. Gallup shares that for consumers who have credit cards, they own an average of 3.7 cards. This means that if you own 4 different cards paying different lenders, consolidating debts would mean you get to focus on one payment every month. This means you will have an easier time juggling your payments because you combine some of them into one. You shorten the list of payment you have to worry about making it a lot easier. As you manage your payments a lot easier with debt consolidation, you also take advantage of a lower monthly payment. This is because you make use of a lower interest rate when consolidating your debt. If you are consolidating credit card debt, use the ecard with the lowest interest rate. Use that to combine your payments. If you can get an introductory 0% card, you get to save a lot of money. One thing you have to remember though is that these are offered for a specific period of time. If you go over that, you might be paying with the same interest rate. Or worse, the new interest rate could be higher than what you were paying for in the past and essentially end up paying a bigger amount. Consolidating your debts can also help you improve your credit score. This is because if you stick to your repayment plan and make sure you do them on time every time, it helps your score. FICO shares that your payment history makes up 35% of your overall score. The more you make an effort in meeting your payments, the better it will be for your score. It is challenging to try and juggle multiple payments every month but there are tips to help you do it correctly. There will be times when you really do not have a choice. You might have accumulated a number of payment obligations over the course of time. From student loans in college to credit card debt for everyday needs of your family. You also have to consider your house and even car payments as well. When you put them all together, you will have a lot on your plate.